Hayabusa2 has taken a photograph of the Earth and Moon using its Thermal Infrared Imager (TIR) as it approaches the Earth for a gravity assist. The asteroid explorer will swing-by the Earth to use our planet's mass to bend its trajectory towards asteroid Ryugu. The images were taken from the 10th to 13th of November 2015, at a distance of 9 million kilometres from the Earth, with the Sun-Earth-Spacecraft angle at 53 degree north from the ecliptic plane (the plane of the Earth orbiting around the Sun). The Earth is the white spot at the centre of the image, with the Moon circling one eighth of its orbit (and 1/8 of a revolution) around the Earth. The TIR is the thermal imaging camera that images the thermal (heat) emission from a body's surface at 10 micrometre wavelengths. The TIR has been developed and is operated in cooperation with the Japan Aerospace Exploration Agency (JAXA), Hokkaido University, Rikkyo University, Chiba Institute of Technology, University of Aizu, Hokkaido University of Education, National Institute of Advanced Industrial Sciene and Technology (AIST), National Institute for Environmental Studies (NIES), National Institute of Information and Communications Technology (NICT), University of Tokyo, Graduate University for Advanced Studies (SOKENDAI), German Aerospace Center (DLR), Max-Planck Institute for Extraterrestrial Physics (MPE), The Open University, UK. The Earth-Moon image taken by TIR (animation). The image is almost the same geometric configuration as the explanation below. (© JAXA). 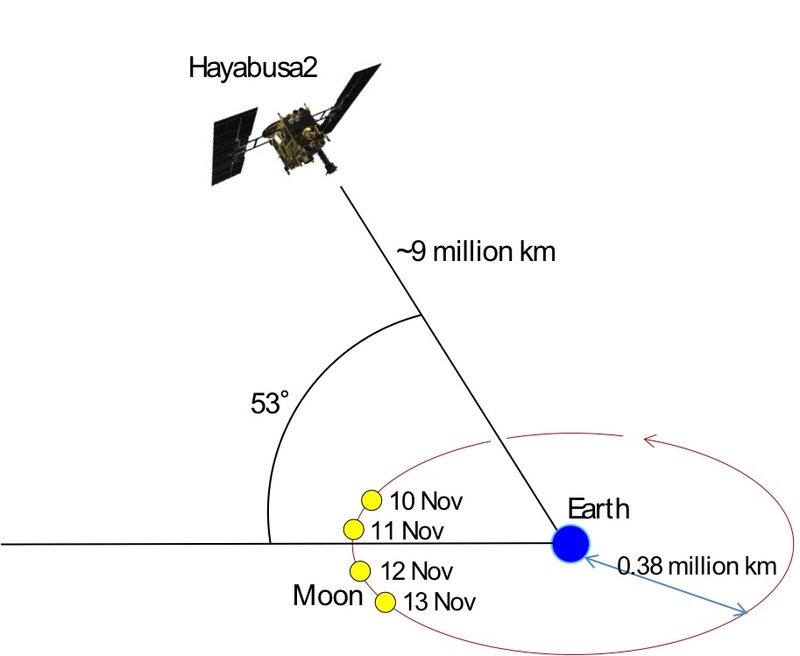 The positions of Hayabusa2, the Earth, and the Moon for each day during the imaging period. The Sun-Earth-Spacecraft angle at 53° is the angle from the ecliptic plane. The plane of the Moon circling around the Earth is declined about 5 degree to the ecliptic plane but neglected in this figure.